A set of 6 filter foams for the OASE BioTec Premium 80000 Drum Filter system. The filter cartridge set is a genuine Oase product, with a large surface area for the growth of beneficial bacteria. Superb filtration results are guaranteed by the use of three different foam grades. The high quality German engineered foams are each set to a given pore size, ensuring consistent unhindered flow-through rates, finer debris extraction and significant biological settlement surface area. In order to ensure the optimum performance of your pond filter, it is crucial that genuine Oase sponges and spare parts are used. Cheap replica parts will produce poor filtration results and will invalidate the Oase Clearwater Guarantee. 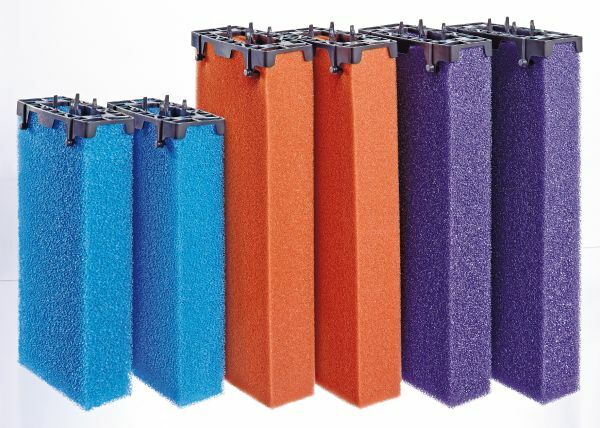 The BioTec Premium 80000 Spare Filter Foam Set contains 2 x (blue) Coarse grade filter foams, 2 x (purple) Medium Grade filter foams and 2 x (red) Fine Grade filter foams. Each filter foam is supplied with attaching clip.